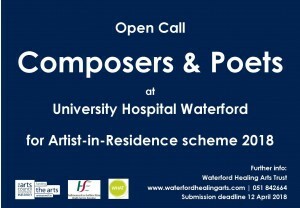 In a new development for 2018, we are inviting poets and composers to apply to be Artists-in-Residence at University Hospital Waterford (UHW) in 2018. This is the first time for WHAT to bring together two art forms under its Artist-in-Residence programme. This exciting new venture is being undertaken as part of our 25th anniversary celebrations. The deadline for submission of applications is Thursday 12 April 2018.